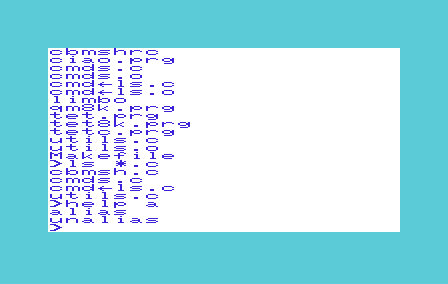 Cbmsh is a unix-like shell for 6502 based commodore computers, like the c64, vic-20 and c128. It features the classic unix commands like ls, more, echo, cd etc. adapted to work on a commodore floppy disk or the modern sd2iec standard. If you want to know more, download cbmsh and have a look at the README and CHANGELOG files. Cbmsh is distributed under the GPL license. It is based on the sash shell. It is coded in C and should be compiled using the cc65 compiler.